UFT members are also members of our state affiliate, New York State United Teachers. As NYSUT members, they have access to a variety of endorsed insurance, financial, legal and shopping/travel/personal programs through NYSUT Member Benefits. The links below provide details about each item listed. For more information, applications or brochures about any of these endorsed programs and services, please contact NYSUT Member Benefits at 800-626-8101 or visit their website. You're also entitled to AFT member benefits and UFT educator benefits. With this plan, you can apply for coverage up to $1 million, if under age 65, at premiums negotiated especially for NYSUT members. Reduced coverage amounts are available for members between the ages of 65 and 84. At age 65, benefits decrease; at age 70, coverage is limited to $20,000 or less. One low premium covers all of your dependent children under the age of 23. This program allows members and their lawful spouses (or certified domestic partners) to apply for coverage up to $1 million for either 10, 15 or 20 years. Your age determines the length of term you may apply for under the coverage. Applicants must be under age 55 to be eligible for the 20-year plan, under age 60 for the 15-year plan and under age 65 for the 10-year plan. This group universal life insurance plan offers you a way to plan for the continuing need for life insurance coverage while taking advantage of the term life insurance that you already have. This program also allows you to purchase life insurance coverage that increases as your term life coverage decreases or terminates. Premiums may be set at a level to produce as much or as little accumulation of cash value at age 95 as you choose. You must be age 70 or under to apply. Enjoy special member rates on insurance coverage for your vehicle, home, condo, apartment, boat, mobile home (New York State only), snowmobile, motorcycle, fire, landlord’s rental dwelling, and personal excess liability (umbrella). Coverage is available in all 50 states. Various discounts may apply. This program provides valuable income replacement benefits to help meet your living expenses if you become partially or totally disabled and are unable to work. Disability insurance can be customized to fit within your budget and still provide peace of mind until you are able to return to work. Long-term, five-year or short-term disability insurance plans are available. This plan provides unlimited toll-free legal advice; a Simple Will, Health Care Proxy, Living Will and Power of Attorney; guaranteed maximum fees for many personal legal matters; and legal assistance at discounted rates throughout the continental United States. The plan can provide assistance with identity theft, debt consolidation and mortgage foreclosure issues. Optional Elder Law and Business Protection Riders are available. 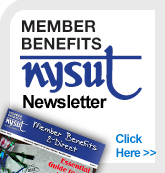 The NYSUT Member Benefits Trust provides and administers this benefit to all members at no charge. You are automatically insured for up to $1,500 in the event of death or dismemberment resulting from accidental injuries; the maximum benefit amount for AD&D for a Common Carrier is $3,000 in the event of death or dismemberment resulting from accidental injuries. This benefit includes travel assistance services provided by Europ Assistance at no cost that focus on providing coordination services to travelers.